5 Seconds of Summer are currently gearing up for the North American leg of their Sounds Live Feels Live tour, which probably means that I will soon lose all credibility as an actual adult and continue my descent into human howler monkey. As the band sweeps through 47 dates in the U.S., Canada, and Mexico from June to September, they'll be bringing some familiar faces on the road with them — and I don't just mean Hey Violet (though they will once again be opening for 5SOS this tour). 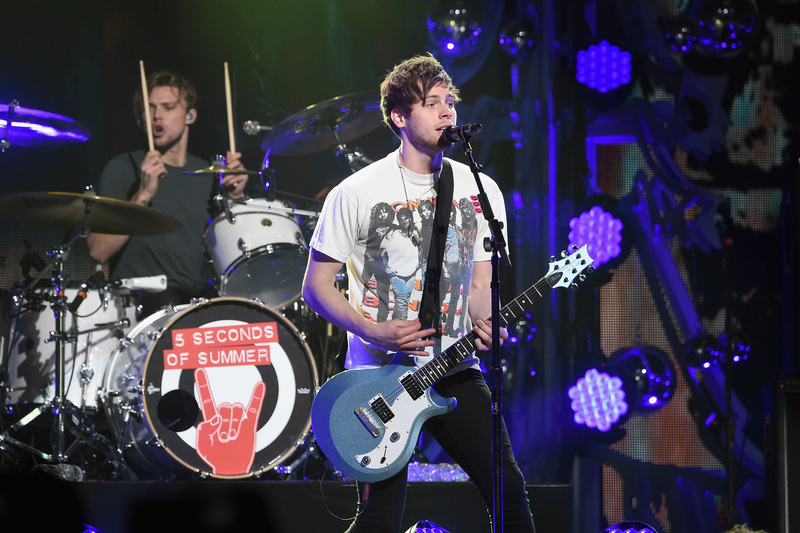 Specifically, the guys have discussed who in Luke Hemmings' inner circle is coming (and who won't be). Will Arzaylea be on tour with 5SOS? Of the 5SOS girlfriends, fans shouldn't expect to see Bryana Holly this time around (Ashton Irwin revealed he is single in a recent radio interview), but it seems like Arzaylea may make an appearance. Hemmings' girlfriend has already tagged along with the guys on the European leg of #SLFL, and based on her Twitter and Insta pics, she's currently in Australia with Hemmings (where the band's been busy drumming on lids of Vegemite and doing other press). So it pretty much stands to reason that Arzaylea, who lives in L.A., will be joining 5SOS on at least part of the North American leg of the tour. While it seems likely that Arzaylea will be hitting the road with the guys, the singer-guitarist revealed who — for sure — will be coming on the bus with the band. In a recent radio interview in the guys' home country (that would be Australia), Hemmings told the hosts that his brother Jack will be coming on tour, which is pretty exciting for the Jack Hemmings fangirls out there. But at least one member of the Hemmings fam will not be joining the boys — Hemmings' grandmother. In one of those awkward, only-on-the-radio moments where the guys had to pick whose grandma is hottest (seriously), Hemmings revealed that his grandma has not yet toured with the band. "Grandma has not come on tour yet," Hemmings laughed, imagining the idea of her on the tour bus with the guys. Which, to be fair, doesn't necessarily rule her out for SLFL North America — but makes it pretty damn likely she will be sitting this one out. Next time, Granny!